I have been working to improve my solo queue ranking to get a better idea of how much my skills have changed recently. I frequently see people who were Silver or Gold in Season Two, but have managed to jump to Platinum or Diamond this season. Just the concept of being Diamond and knowing that I’m competing with the top tier of players gives me hope and drives me to improve. 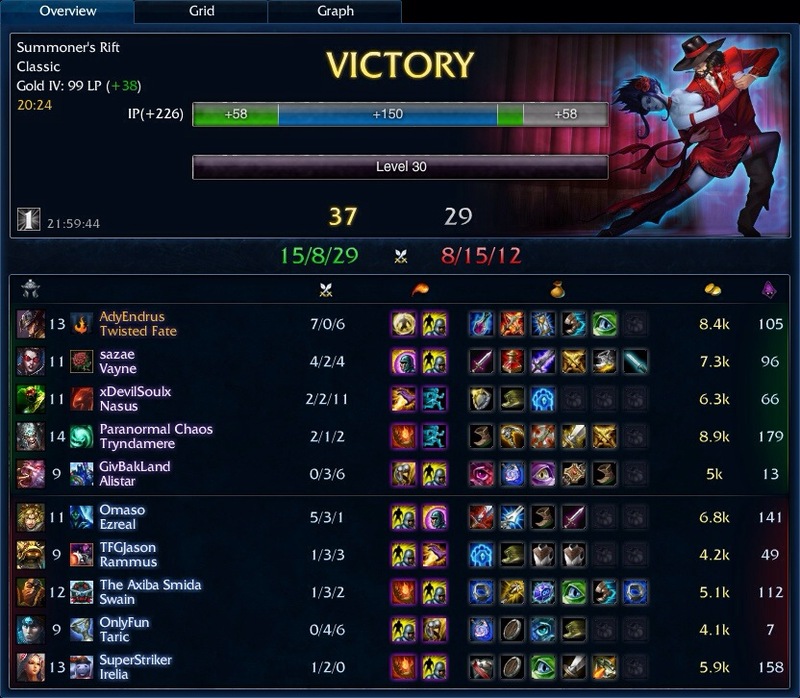 In a recent game as Twisted Fate I had the strange opportunity to have a massive impact in a team fight situation. Normally, I feel like Twisted Fate is ideal for creating an out-numbered scenario, where he coordinates a gank with his jungler and shows up to create a 3v1 or 4v2. Instead I fouls myself using my ultimate to warp into mid lane where we had already lost a team mate. As I landed I threw the red card I had locked to deal area of effect damage and slow as many members of the enemy team. Immediately after that card landed Taric used his Exhaust to lower my damage output. I still threw my Wild Cards to finish Swain off. Stepping back I worked on securing a gold card to peel the Rammus off of my poor Vayne that was doing a great job to resist his damage. After we finished off Rammus we poked Taric down. It was at this point that I heard the announcer call out a Triple Kill and realized it was me. I saw Ezreal was fleeing from Nasus and Tryndamere, but had waning health. I tried to move into range. My glimmer of hope was Ezreal stepping back towards the fight to help his Irelia. I pounced on that opportunity and used Flash to close the gap. Just as I entered auto attack range with my gold card locked Ezreal used Arcane Shift to distance himself. Knowing that he would think he was safe if I turned to fight Irelia I threw my Wild Cards where he would turn. Without another option I dropped my gold card on Irelia and waited for my team mates to catch up to her. Just as I had predicted, Ezreal turned to fire a Mystic Shot in my direction and ate my Wild Card, taking me up to a Quadra Kill. I walked Irelia into her own base, securing another gold card and restricting her movement as she tried to escape. The passive proc from Stacked Deck readied as she slipped to beneath 100 life. With over 150 armor but a low amount of magic resistance my Stacked Deck shredded her remaining life and completed the coveted Penta Kill. I immediately thanked my team. I clearly had not done all the work, but I had assisted in finishing off all the kills. I definitely let out an excited howl. It had been a long time since I had managed a penta in a ranked game. It’s different when your friends or the enemy team assists you. This was earned. I put my life on the line diving into the enemy team with my ultimate when I only had two items. I’ll post the video link later or you can find it on my twitch channel.